Tonight, Michele Obama speaks out, for the first time, since yesterday’s press conference during which her husband criticized Rev. Wright. She talks about the controversy, how her husband finally put the hammer down, race and the possibility of Hillary Clinton as a running mate. We want to hear your thoughts so we’ll start posting comments at 10p ET and stop at 11p ET. Editor's Note: Marty issued the following statement this evening. I am “on the road” this week and regrettably cannot respond personally to the numerous e-mails I have received regarding Pastor Jeremiah Wright. Earlier this month The Chronicle (of Higher Education) Review and a local TV program asked me to appraise Wright’s role and achievement as pastor of Trinity Church. I attempted to put his pastoral and “preacherly” work into congregational perspective. The article was widely circulated and remains available on the web. In the new circumstances, I will have nothing more to add, since the new context is entirely political and not churchly. Those who read me in my five weekly or biweekly outlets know that I make it a practice in them not to mention candidates and candidacies for public office, as an interpretation of my vocation in “civic pedagogy,” not partisan expression. Many of you have asked about the boys of the Yearning for Zion ranch in El Dorado, TX. Where are they? Is there concern some of the boys in this polygamous sect may have been abused? Today, some answers on that front. Investigators are now looking into the possible sexual abuse of some young boys from the YFZ ranch. An inspiring story of survivial and renewal. Christian Amanpour takes us back to Sarajevo. I think the video and the story really speak for themselves – it’s worth watching. 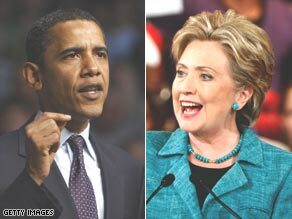 Barack Obama and Hillary Clinton are statistically tied in Gallup's national tracking poll. Presidential politics is a rough game, intensified by the instantaneousness of the information age. Not for the faint-hearted. Thus, it’s hard to understand why Sen. Barack Obama didn’t unequivocally disavow Rev. Jeremiah Wright a month ago,leaving ambiguous the lines along which this minister influenced his perspective on race in America. Perplexingly, Mr. Obama missed another opportunity. While he emphatically declared that Rev. Wright’s messages are “antithetical to our campaign,” Americans are still awaiting to know what his presidency will be about on the issues of our daily lives, if he wins the nomination. Sens. Obama and Clinton have failed to harness the distractions of their surrogates, allowing them to fill in the gaps on sensitive social issues they're not addressing. In Ms. Clinton’s case - most prominently, strategist Mark Penn and her husband. Instead of a constructive, beyond-the-slogans debate about race, gender and class and how their presidencies will to lead to greater unity - which Americans want to hear - valuable campaign time is given to damage control, undermining their credibility and stoking the fires of cynicism about all politicians. All Americans and the future direction of our nation are shortchanged. Especially shortchanged are the issues about which women want answers - pay equality, domestic violence, affordable healthcare, educational opportunities, reproductive rights - not on their websites, but spoken as plainly and directly as they do when they defend threats to their political ambitions. Author, Acts of Faith: The Story of an American Muslim, the Struggle for the Soul of a Generation. I discovered in the African American tradition – the poetry of Langston Hughes and Gwendolyn Brooks, the novels of Toni Morrison and Ralph Ellison, the scholarship of Cornel West and Henry Louis Gates, the sermons of Martin Luther King and, yes, Jeremiah Wright - a way of being that gave an honored place to my heritage as an Indian and a Muslim, and an invitation to bring those parts of me to the American project, which is fundamentally about people from the four corners of the earth building a nation together. When I first moved back to Chicago in late 2001 to start the Interfaith Youth Core, it seemed like I heard Jeremiah Wright’s name mentioned every place I turned. All kinds of people –rich folk and poor folk, traditionalists and progressives, young people and old people, black and white, believers and atheists – told me I had to go see him preach. Editor's note: WE ARE UP FOR A 'WEBBY AWARD', THANKS TO YOU!- SO VOTE FOR US HERE! Everyday we post a picture – and you provide the caption. Our staff will get in on the action too. Here is today’s “Beat 360°” pic of the day: Toyota's violin-playing robot plays at Universal Design Showcase on last year in Tokyo, Japan. 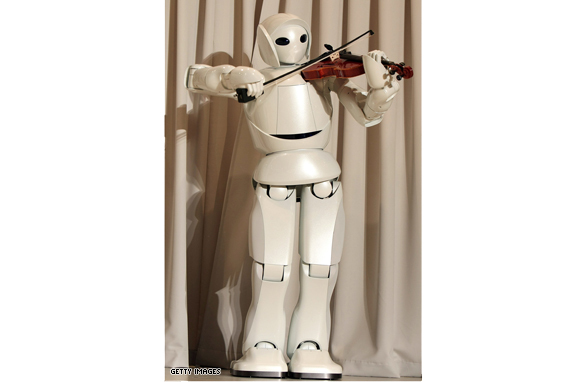 The robot, which has 17 joints in both arms, uses precise control to play the violin. 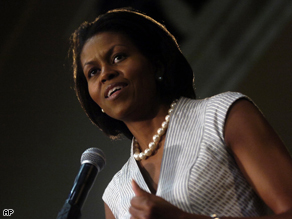 AC360° will have the first primetime sit-down interview with Michelle Obama, wife of Presidential candidate Sen. Barack Obama. We’ll talk about how the re-ignited Rev. 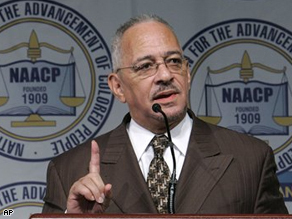 Jeremiah Wright controversy is affecting the family, her husband's campaign, and everything in between…. Editor's note: This first appeared in the National Review, on March 18, 2008. I just figured out how Obama gets out of this. It's devious. But it may be only way. He leaves this thing alone for the time being and suffers through the next few primaries. He hangs onto his pledged delegate lead, makes the argument that pledged delegates are all that matter. So far, polling shows Democratic voters agree. He prevails and wins the nomination. Then, he deploys The Pastor Plan. It goes like this. Pastor Wright arranges to give a speech. In it, the pastor makes such outlandish and slanderous claims, not unlike we've already heard, that Obama has no choice but to say, "Enough! Jeremiah has gone too far. I cannot abide his divisive, harmful, and inappropriate language. He does not speak for me or my family which is why we must, with heavy hearts, sever our relationship. He will always be a friend and welcome at my door. But I cannot continue to take his counsel, religious or otherwise." It helps here if the pastor has used some swear words and invented new conspiracies. Obama sends Pastor Wright a heartfelt letter, more in sorrow than in anger, which he posts on his website. He holds a press conference to inform the public that he has spoken with the pastor privately and explained his position. Obama vows to carry on the church's work of charity and compassion. He stages some events showing him involved in a multicultural community service project, visits a West Virginia coal mine, stuff like that. And he exhorts his fellow Americans to join him in the journey toward racial reconciliation. Timing is key. Sometime right after the inevitable 527 Pastor Wright ads start running. In fact, they can be the pretext of the pastor's speech. The 527 ads provoke the Reverend's fury. Obama reacts. Bam! It's over. Pastor problem solved. Think the Clintons wouldn't do it? LA TIMES: Obama 'Outraged' by Wright...Barack Obama angrily disowned his former pastor and friend of 20 years, the Rev. Jeremiah A. Wright Jr., saying Tuesday that Wright's recent comments about race, religion and the U.S. government were "divisive and destructive" and had undermined the purpose of Obama's presidential candidacy. WASHINGTON POST: Obama calls ministers comments 'outrageous'...Laboring to contain damage to his presidential candidacy, Obama said Wright's recent appearances had left him angry and sad. WASHINGTON TIMES: Obama 'Outraged,' 'Insulted' By Pastor...Sen. Barack Obama yesterday broke with the Rev. Jeremiah A. Wright Jr., saying he was "outraged" and "insulted" by his former pastor's racial and anti-government rants — rhetoric he said he did not hear the pastor use in church. USA TODAY: Obama Breaks with Longtime Pastor...Democratic presidential candidate Barack Obama severed ties Tuesday with Jeremiah Wright, decrying his longtime minister's latest remarks as "a bunch of rants that aren't grounded in the truth." "I want to be very clear that moving forward, Reverend Wright does not speak for me. NY TIMES: Obama Breaks With Ex-pastor...Senator Barack Obama broke forcefully on Tuesday with his former pastor, the Rev. Jeremiah A. Wright Jr., in an effort to curtail a drama of race, values, patriotism and betrayal that has enveloped his presidential candidacy at a critical juncture. Suzanne Malveaux will monitor the campaign trail for us tonight..both Hillary Clinton and Barack Obama will be in Indiana today...we will bring the latest on the issues they are talking about AND, of course, the "Wright Fallout' should there be any more..
"Why don't Rev. 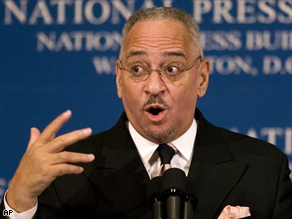 Jeremiah Wright just sit down and be quiet? Don't he know he's hurting Sen. Barack Obama?" If I had a nickle for every time someone has asked, emailed or texted me that in the last three days, I could retire. And trust me, I get it. Wright has had a negative impact on Obama's presidential aspirations because of the constant playing of snippets of his sermons. And many believe that his interview with Bill Moyers on PBS; his speech at the Detroit NAACP; and the appearance at the National Press Club on Monday morning is all about him. Yes, that is all true. But what would you do? If your 36 years in ministry was degraded, would you go and hide? If right wing radio and TV hacks like Sean Hannity, Lars Larson and others called you a bigot and anti-Semitic, and others who don't even realize that you served in the Marines and the Navy for six years castigated you daily as being un-American, would you defend yourself? But there is a fine line that you must walk. And depending on how you do could determine how you are viewed and whether the presidential aspirations of Obama are severely damaged.